Experience an abundance of blossoming trees with the L’Occitane Cherry Blossom Eau de Toilette spray, a fresh and flirty scent that captures the magnificence of spring. The soft, fresh and floral fragrance is subtle and very beautiful. Inspired by a magical landscape of light pink flowers in the Provence, it celebrates the poetic charm of the cherry blossom and its delicate petals set against the bright blue sky. AQUA/WATER** - ISONONYL ISONONANOATE - GLYCERIN** - CETEARYL ALCOHOL** - BUTYROSPERMUM PARKII (SHEA) BUTTER** - CYCLOMETHICONE - CETYL ALCOHOL** - PRUNUS CERASUS (BITTER CHERRY) EXTRACT** - ROSMARINUS OFFICINALIS (ROSEMARY) LEAF EXTRACT** - COCOS NUCIFERA (COCONUT) OIL** - HELIANTHUS ANNUUS (SUNFLOWER) SEED OIL** - CERA ALBA/BEESWAX** - CORN STARCH MODIFIED - ETHYLHEXYLGLYCERIN - PHENOXYETHANOL -CHLORPHENESIN - PROPYLENE GLYCOL - HYDROXYETHYL ACRYLATE/SODIUM ACRYLOYLDIMETHYL TAURATE COPOLYMER - XANTHAN GUM - CETEARETH 33** - POLYSORBATE 60** - SORBITAN ISOSTEARATE - TOCOPHEROL - PARFUM/FRAGRANCE - LIMONENE - ALPHA-ISOMETHYL IONONE - LINALOOL . 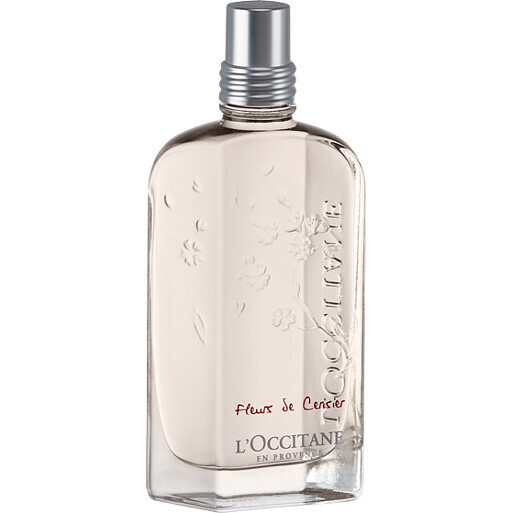 L'Occitane Cherry Blossom Eau de Toilette Spray 75ml is rated 4.8 out of 5 by 6. Rated 5 out of 5 by Mcleod66 from It's amazing My cherry blossom has just arrived and I'm a very pleased lady I have had it before but not for awhile ,I think it will now be my favourite because I missed it so much when I had none,when I opened the package it was packed with care and there was a free nail file that just made my day not only that but the price of the fragrance was very good ,thank you for sending it so quickly I was so in need of a treat I'm now going to look for next month's treat !!! Rated 5 out of 5 by Pollyanna5 from Feeling fresh Gorgeous fresh fragrance - does not overpower. Brilliant service and arrived perfectly packaged. Rated 5 out of 5 by Eoljjang from Great perfume! I've read a lot of good reviews about this perfume and I was so eager to try it out and when I did, I wasn't disappointed at all! The smell is really nice for me and it lasts almost all day for me which is good.